This short was included on the dvd release of my film “The Magnificent Shadow” by Noiseville.com. 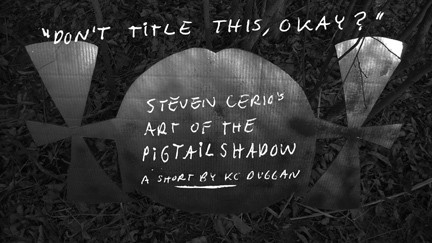 As the sub-title suggests the film is an interview with me (Steven Cerio) about the unruly mass of sketches and art accumulated during the two years of shooting my film “The Magnificent Pigtail Shadow”.KC decided to go without soundtrack music which was a great choice…even if I begged her to use some of my music! My answers come from an interview with D.P. KC Duggan and Thaddeus Chapman. Lots’s art abounds…and lots’a answers to unanswerable questions. Fun.